Philadelphia, March 26, 2019 — If you live in the Delaware Bay area, you have caught a glance in the distance of a monstrous structure floating in the bay. Suspicions have been flying on social media of what it could possibly be. That monstrous structure will be departing the Bay and trekking up the Delaware River to The Port of Philadelphia soon enough. The structure, a huge ship carrying three super post-Panamax container cranes is scheduled to transit up the Delaware River overnight Tuesday into Wednesday, March 27 to the Packer Avenue Marine Terminal. The cranes are identical to the two that arrived at the Port last year. The Delaware River & Bay Pilots are scheduled to board the Zhen Hua 25, a 766-foot-long heavy-lift ship, Tuesday, March 26 at Big Stone Anchorage and begin the journey to South Philadelphia. ZPMC is the largest heavy-duty equipment manufacturer in the world and delivers more than 200 cranes every year around the world, including many seaports in the U.S. No container cranes currently are manufactured in the U.S.
Upgrades included strengthening and realigning a berth and adding five new super post-Panamax cranes capable of serving two 18,000-TEU container ships at the same time. 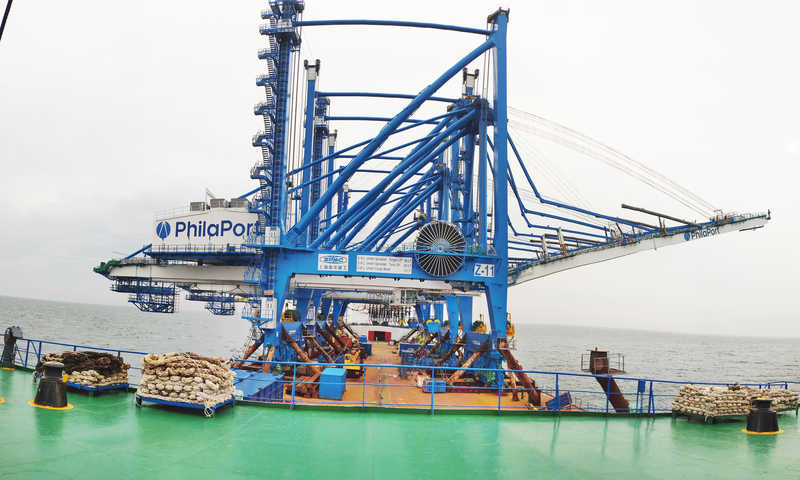 » Follow us on social media for updates #PhilaPortCranes.